Oh! Supreme Lord Guruvayurappa, Who can recollect your glories or count the sand particles in this Universe,? The supreme Lord, who is measured the Universe with three stride, preserver of the Universe and provider of eternal bliss, wealth, joy at the touch of his lotus feet I shall earnestly pray to attain the supreme abode of Lord which is the place of perpetual bliss and the place where his zealous devotees remains in a state of ecstasy and consumes nectar like immortality. Oh! Supreme Lord Guruvayurappa, Oh ! 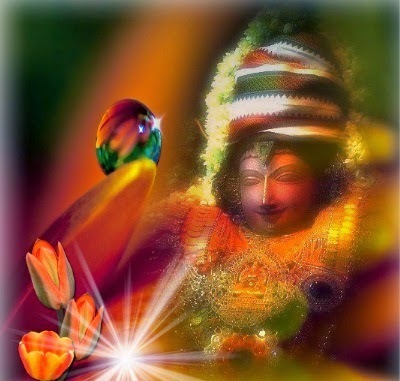 Lord Vishnu, who is in existence before the creation of Universe, creator of all living and non-living beings, remain up-to-the-minute and splendor of all the deities, devotees whoever venerate Lord Krishna and his various incarnation through the methods of Yagna or Archana will remain in state of renunciation and supreme bliss, eventually he/she will attain your supreme Abode. Oh! Supreme Lord Guruvayurappa, The poets describes you the way they have understood your splendor which was eulogized by Vedas, and narrates various incarnation and marvelous sporting activities of you. Oh! Lord Vishnu, chanting your numerous holy names with utmost faith and devotion would provide immense happiness and eternal wisdom and knowledge. Oh! Supreme Lord Guruvayurappa, Oh! soul, always remember the marvelous deeds of Lord Vishnu who has established righteousness and served Lord Indra as a servant and close associate as well, to bring welfare in the Universe, supreme Lord who is experienced by Yogis and Siddhas in a complete transcendental state, and who is radiant in the minds of holy men and scholars who makes an effort to describe in various sacred hymns. Oh! 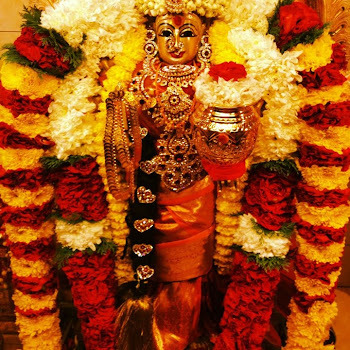 Supreme Lord Guruvayurappa, The unborn or already born who are not aware of the limitless glories of you, I shall recite your various holy names and sacred hymns praising your splendor, keeping in mind that you are the provider of welfare who resides above the three worlds in the glorious abode of Vaikundham. Oh! Supreme Lord Guruvayurappa, In the beginning the water came into existence and Oh! Vibho, Oh! Aja, you have appeared in the reclining posture in the waters, holding all the Jeevas merged in you. 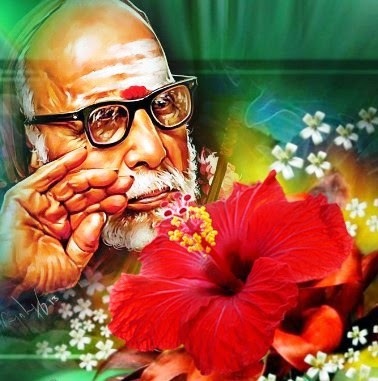 A lotus with eight petals instigated from your navel which represents eight quarters and Kanakadharni/ the center portion constitutes the Universe. Oh! Supreme Lord Guruvayurappa, Oh! Soul, you are not aware of the eternal truth that Lord Vishnu is the creator of the Universe and resides as a subtle part in you. Oh! Jeevas, You are completely wrapped in the illusion and obsessed with the names/Nama and shapes/Roopam, it is pathetic to note that you are performing the sacrifices in order to achieve sense gratification and not because of love to Lord Mukunda. Oh! Supreme Lord Guruvayurappa, Although you have thousands of head/Sahasrasheersha, eyes/ Shasraksha, Sahasrapadh/feet, Sahasrani/various forms, you have restricted yourself and remains in the hearts of Jeevas/living beings, You are the knower of all/Bootham, Bhvyam, Sarvam etc… Oh! Parapurusha Bhagavan, you are the body and its senses, ultimately experience the supreme bliss of liberation. Oh! Supreme Lord Guruvayurappa, My salutation to Anantha Shuddha Gnana Athman/eternal supreme knowledge consciousness, who has taken the form of three worlds, glorious personified reveals only a small portion of it in this Universe, the major part of supreme bliss is shines above all. Oh! Supreme Lord Guruvayurappa, Oh! Nirguna Parabramam, your formless nature is very difficult to understand, your pure Sathvic form as Saguna Brahmam is visible and it is like the waves in the ocean of nectar, which is Sarvothkrushtam/most superior, possess Guna/Rasa/Chitham that attracts the mind with its attributes. Oh! 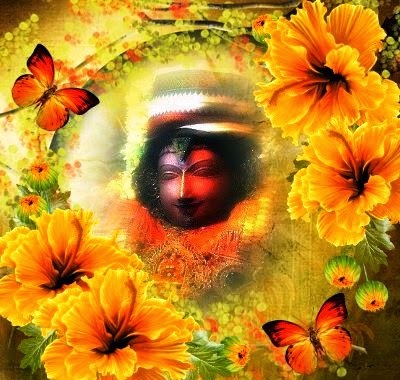 Krishna, therefore I shall desire to venerate idol form of you. Oh! 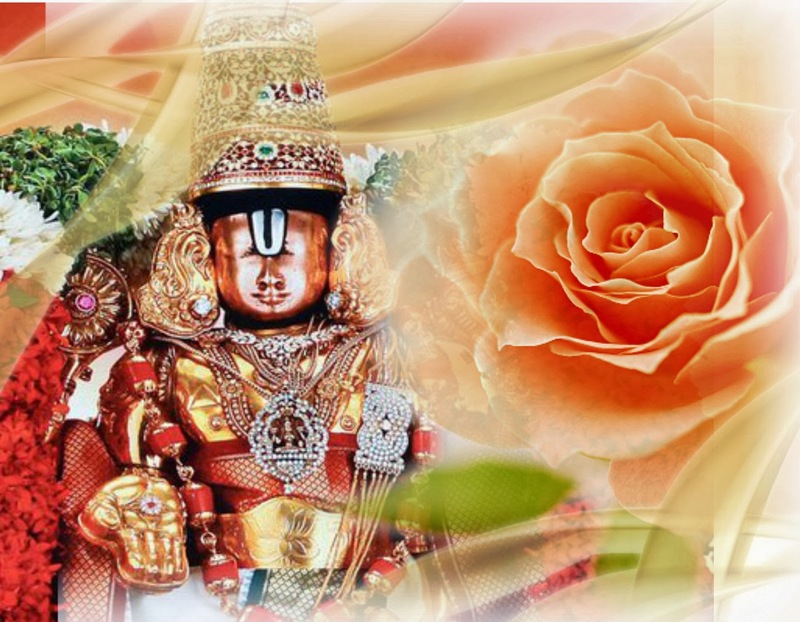 Pavanapurapathey, we earnestly pray to protect us from all ailments. Oh! Supreme Lord Guruvayurappa, Oh! Ramajane, I understood that it is not easy to attain your blessings/prosperity for your devotees, because it creates arrogance pride in them. Therefore, you will change them into dispassionate and fulfill their desires, on the other hand the dispassionate avail your blessings instantly. It is definite that your devotees never encounter any disgrace in their life. Oh! Supreme Lord Guruvayurappa, Lord Brahma, Lord Shiva and other deities get pleased and get infuriated very easily, and they are worshipped by the individuals with the nature of Rajasik and Thamasik nature, eventually it’s unfortunate that they will lead themselves to disgrace with their arrogance. It is evident from the legend of Vrukasura. Oh! Supreme Lord Guruvayurappa, Once, Vrukasura, son of Shakuni enquired Maharishi Narada about the deity who gets pleased easily. 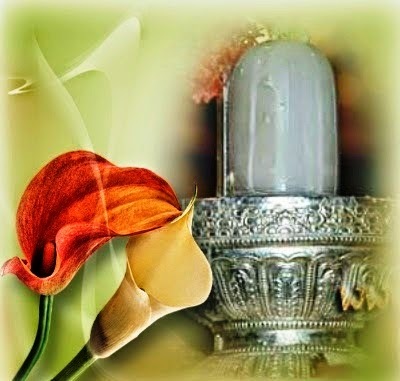 Maharishi Narada advised him to worship Lord Shiva, because you will not sustain the evil-minded people easily. Oh! Supreme Lord Guruvayurappa, Consequently Vrukasura underwent severe penance worshipping Lord Shiva/Jagannatha/Lord of the Universe, on the seventh day he lost his patience and in severe anger prepared to cut off his head. Immediately Lord Shiva appeared before him and offered a boon requested by Vrukasura, that the moment he place his hand on others head they will die immediately, it was a cruel and mean boon indeed. Oh! Supreme Lord Guruvayurappa, Immediately Vrukasura rushed towards Lord Shiva like a lion to its savior. Lord Shiva was afraid of Vrukasura and ran out of fear to all directions, looking back for him and the whole world was watching it quietly. You have seen Lord Shiva from far distance that he was approaching your abode. Instantly you have assumed the form of a clever Brahmachari and waited for Vrukasura. Oh! Supreme Lord Guruvayurappa, “Victory to son of Shakuni ! Why are you chasing unnecessarily keeping faith on the ghost’ words? If you have any doubt on my words, place your hand on your head and experience it” By saying so, you have fooled Vrukasura. Abruptly, Vrukasura placed his hand on his head and fell down like an uprooted tree. This is the fate of individuals who worship other deities, even Lord Shiva/Shulina:/Shankara takes shelter in you. Supreme Lord Guruvayurappa, Once, Sage Bhrugu was prompted by the ascetic residing on the river bank of Saraswathi to conduct a test to know the Trinities who has possessed the pure Sathvic Gunas. Consequently Sage Brighu went to Lord Brahma and did not pay any respect to him, Lord Brahma was controlled his anger and eventually Sage left his abode. Shortly, Sage Brighu went to abode of Lord Shiva, there too he did not pay respect to the Lord was agitated, desired to kill the Sage was intervened by Goddess Sri Parvathi. Ultimately Sage Brighu left to your abode. Oh! Supreme Lord Guruvayurappa, Sage Brighu arrived in your abode and found you in reclining posture on the lap of Goddess Sri Mahalakshmi. The Sage gave a hard hit on your chest; soon you rose amusingly and requested to forgive you and also said that the foot print of the Sage will remain as a mark of adoration on your chest always. Oh! Supreme Lord Guruvayurappa, The ascetics who were residing on the river bank of Saraswathi understood that you have possessed the supreme Sathvic Guna among the Trinities; eventually they expressed their devotion to you and attained liberation. Oh! Achyutha, I shall prefer to venerate you because of your supreme nature of Sathvic Gunas. Oh! Supreme Lord Guruvayurappa, In the beginning of the creation of Universe, the Veda sung praising your glories as you are the Sath Chith Parama Rasam/supreme consciousness and bliss, you are the supreme embodiment, you are the Paramathma Bhooman/Supreme being of infinite nature and you have personified as the meritorious reward of the cowherd women. Oh! Pavana Puravasin, we earnestly venerate you and pray to eradicate our sorrows and grief. Oh! Supreme Lord Guruvayurappa, Kuchela was a fellow disciple in the hermitage of Maharishi Sandheepani, he was a passionate devotee of you. He was a householder/Gruhasthashrami with controlled mind, he peacefully spend his days without any worldly/material desire. Oh! Supreme Lord Guruvayurappa, His wife was identical in his nature, was not achieved the same state renunciation like him. Once she asked her husband why can’t you approach your close associate Krishna, Ramapathi/consort of Goddess Sri Mahalakshmi to obtain some income? Oh! Supreme Lord Guruvayurappa, Kuchela was troubled by the pitiable state in the family, set off to Dwaraka with an immense eagerness to meet you rather than acquire wealth from you. Kuchela had the abhorrence towards wealth which would generate pride and arrogance. He carried some flattened rice on the corner of his upper garment as an offering to you. Oh! Supreme Lord Guruvayurappa, Ultimately Kuchela reached your marvelous city of Dwaraka, he passed through various stunning houses and arrived at the house of Mithravrindha. He had felt extreme serenity as soon he entered in the city just like your supreme abode Vaikundha. You have expressed supreme kindness which was beyond description. Oh! Supreme Lord Guruvayurappa, after a generous hospitality by you and your consort was fanning Kuchela, you have continued to converse with him and recollecting those incidents by holding his hands. You have recaptured those unseasonal rain occurred during your journey to woodland with him to collect fire wood at the command of Gurupathni/wife of your Preceptor. Oh! Supreme Lord Guruvayurappa, Kuchela was too shy to reveal the flattened rice, you have snatched away the flattened rice and ate a hand full. Instantly, Rama/Goddess Sri Mahalashmi approached and held back your hands saying that much was enough indeed. Oh! Supreme Lord Guruvayurappa, Kuchela was greatly honored by the devotee of devoted and he was happily stayed one night in your city. The next day he went out without any wealth in hand. Oh! Supreme Lord, the ways of your blessings are very strange indeed. Oh! Supreme Lord Guruvayurappa, Kuchela spoke to himself “If I have asked for wealth, Krishna would have definitely provided that, what I would say to my wife?” he walked away immersed in your thoughts, your smile and your talks. Shortly his eyes fallen on the gem studded splendid home. Oh! Supreme Lord Guruvayurappa, Kuchela was wondered for a while thinking that he might have lost his way to home. While entering home he saw his wife adorned in various precious ornaments and she was surrounded by many ladies. Kuchela immediately realized your grace and compassion and felt most wonderful. Oh! Supreme Lord Guruvayurappa, even though Kuchela was resided in the gem studded splendid home, his uninterrupted devotion was growing incessantly, ultimately attained liberation at your lotus feet. 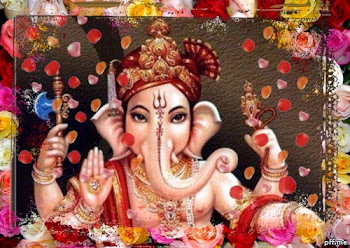 In this way, you have fulfilled the desires of your devotee. Oh! 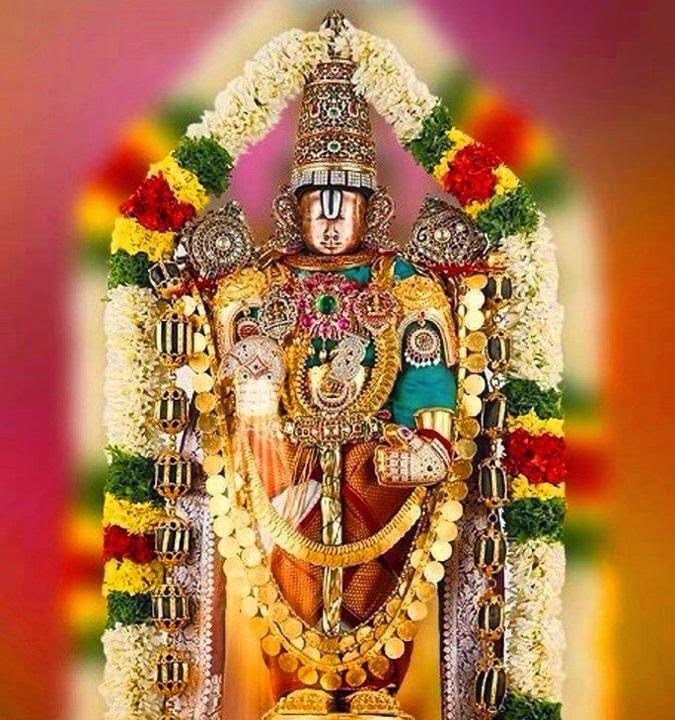 Maruthpuradheesha, we earnestly pray to eradicate our ailments.